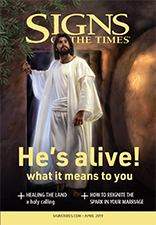 Does it make a difference in your life today that Jesus is alive and well in heaven? The Bible: Inerrant or Infallible? Are there contradictory statements in the Bible? It���s an important part of life and a relationship with Jesus. We can learn from the Bible���but there are also other ways. A generous heart isn���t enough. This story illustrates the Bible promise that God will provide for all our needs. At times we need to be bold for God. What Difference Does God���s Law Make? We can break it, but we will suffer the consequences. Caring for the natural world is an act of worship.